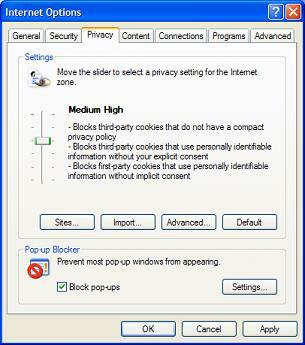 This section provides a tutorial example on how to delete all cookies currently stored in IE and change settings to ask IE to block potential tracking cookies. 1. Run IE, and click "Tools > Internet Options... > General". Blocks third-party cookies that use personally identifiable information without your explicit consent. Blocks first-party cookies that use personal identifiable information without implicit consent.